The steady-state assumption, which states that the production and consumption of metabolites inside the cell are balanced, is one of the key aspects that makes an efficient analysis of genome-scale metabolic networks possible. It can be motivated from two different perspectives. In the time-scales perspective, we use the fact that metabolism is much faster than other cellular processes such as gene expression. Hence, the steady-state assumption is derived as a quasi-steady-state approximation of the metabolism that adapts to the changing cellular conditions. In this article we focus on the second perspective, stating that on the long run no metabolite can accumulate or deplete. In contrast to the first perspective it is not immediately clear how this perspective can be captured mathematically and what assumptions are required to obtain the steady-state condition. 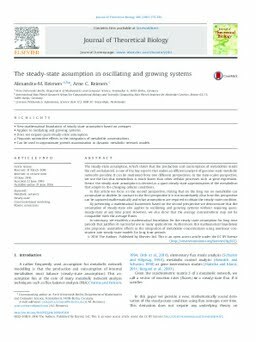 By presenting a mathematical framework based on the second perspective we demonstrate that the assumption of steady-state also applies to oscillating and growing systems without requiring quasi-steady-state at any time point. However, we also show that the average concentrations may not be compatible with the average fluxes. In summary, we establish a mathematical foundation for the steady-state assumption for long time periods that justifies its successful use in many applications. Furthermore, this mathematical foundation also pinpoints unintuitive effects in the integration of metabolite concentrations using nonlinear constraints into steady-state models for long time periods.